Some of Australia’s most pristine wilderness is about to be improved significantly with the recent release of a new biological control agent for the widespread and persistent Crofton weed on Lord Howe Island. The weed has spread rapidly across the southern part of the island for many years with devastating effects on the natural flora and fauna. This new management tool for Crofton weed will complement the current eradication plan for other weeds on the island and assist in ensuring that the World Heritage-listed site maintains the integrity of its status. Crofton weed (Ageratina adenophora) poses a serious environmental threat to agricultural grazing and natural bush lands, including 150 reserves across New South Wales. It spread rapidly across the eastern coastal areas of Australia in the 1940s and 1950s, and even managed to make the 600 kilometre easterly trek from the mainland to Lord Howe Island. CSIRO’s research has focused on a rust fungus, Baeodromus eupatorii, from Mexico, to boost the biological control of Crofton weed in Australia. 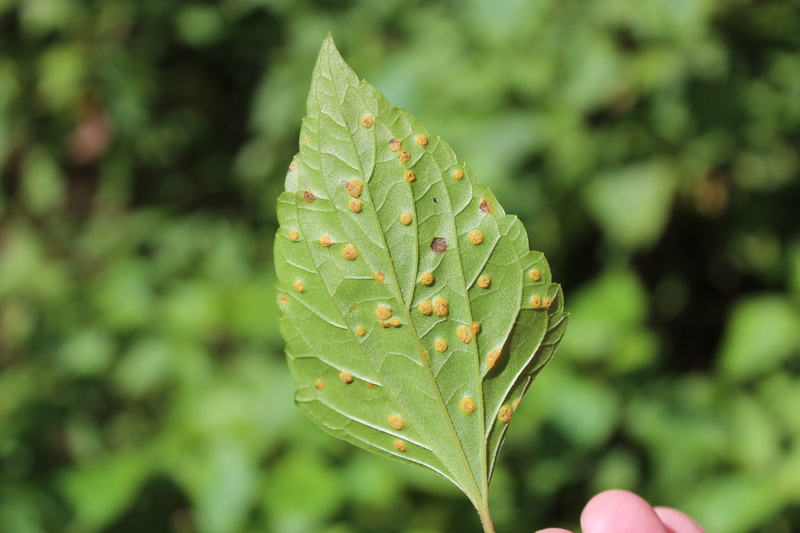 The Crofton weed rust fungus infects the young leaves and stems of the plant, stunting development and disrupting its ability to reproduce. It has undergone rigorous testing and has proven safe for introduction to Australia, with a number of initial successful releases on the NSW south coast in 2014. Dr Louise Morin from CSIRO’s Health and Biosecurity explains the benefits of using biological control for managing Crofton weed on Lord Howe Island. "Crofton weed is mostly found in areas of Lord Howe Island that are difficult to access because of the terrain, making manual removal of the weed or the use of herbicides virtually impossible," Dr Morin said. "This is the reason why Crofton weed is not a target in the weed eradication plan for the island. "The weed can quickly invade disturbed areas, such as landslides, with its wind-dispersed seed and is a continued threat to intact plant communities of the southern mountains. "Working with staff from the Lord Howe Island Board, the rust fungus has now been released at five strategic locations on the island. "Once the fungus has established at these sites, it will readily spread on the wind through the landscape and cause debilitating damage on the weed," she said. Penny Holloway, Chief Executive Officer of the Lord Howe Island Board, said that CSIRO’s new management tool for Crofton weed is an important asset to their continuing weed management strategy. "The biodiversity of natural habitats on the island is critical to our World Heritage listing status, a fully integrated weed management strategy is needed to protect the environment from invasive weed species," Ms Holloway said. “Between 2004 and 2014, we managed to reduce the impact of dense and mature weed infestations across more than 1,000 hectares of the island by 80 per cent. "A significant suppression of Crofton weed infestations by biological control will greatly facilitate the weed eradication program because Crofton weed harbours many of the highly invasive weeds that are targeted by the program," she said. In partnership with landholders, the Crofton weed rust fungus has been extensively released on the east coast of Australia over the last 2 years, with support from the NSW Department of Primary Industries and NSW Environmental Trust. All signs so far are that this new biological control agent will provide a sustainable tool to reduce populations of Crofton weed. Weed biological control using plant pathogens was pioneered in Australia nearly half a century ago with resounding success, preventing a range of weeds from threatening our agricultural and natural ecosystems.